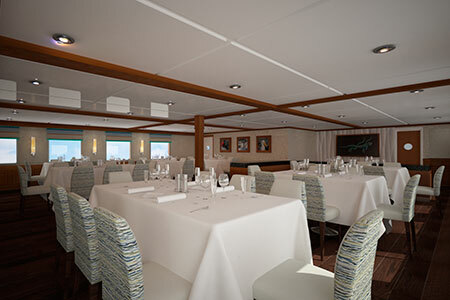 The Celebrity Xperience (formerly known as the Galapagos Eclipse) offers all the amenities and services of other luxury cruise ships in the Galapagos with only a fraction of the number of passengers. 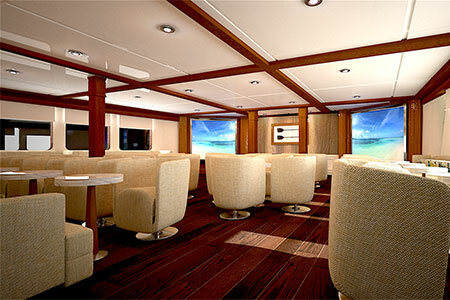 She is extremely spacious for 48 passengers and boasts an English-speaking naturalist for every 12 passengers. 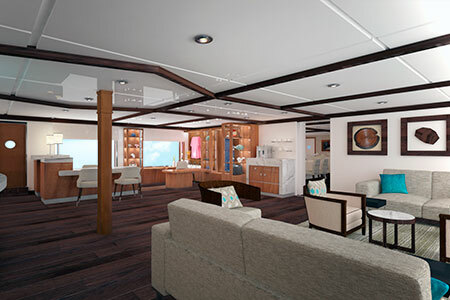 On-board amenities include a Jacuzzi, an observation deck, al fresco dining area, entertainment center, library, lounge and a gift shop. 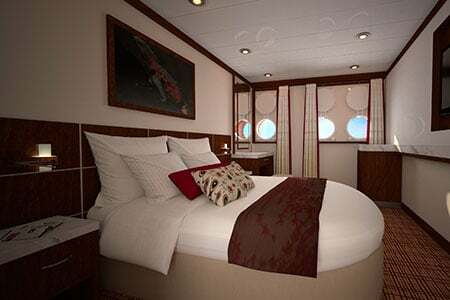 Celebrity Xperience offers four cabin categories, all stylishly decorated and equipped with private facilities, air conditioning, and ocean-view windows or portholes. 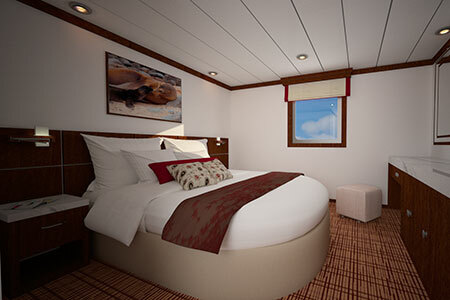 Two Staterooms on each cabin deck have interconnecting doors to accommodate families. All prices in United States Dollars. 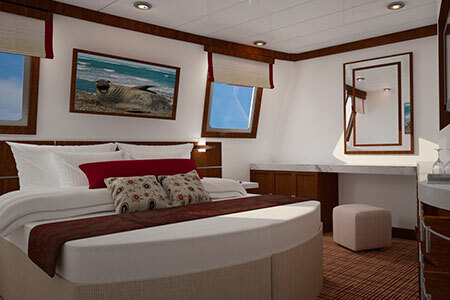 • During peak season Christmas (Dec 23-30) and New Year (Dec 30-Jan 06) a surcharge of $400 NET per person applies. I wanted to give you a great big THANK YOU!!! For everything with this trip. What a truly spectacular place. I knew it would be beautiful, but the beaches far exceeded my expectations. The Eclipse was perfect. Large enough so that we didn't feel every little swell yet small enough that we felt like we knew everyone on board. There were only 45 people on board from day 1 and we were 21 of them. On Thursday 16 people got off the boat, so for Thursday, Friday, and Saturday we made up 21 of the 29 guests on board. All of the activities, naturalists, crew members and staff couldn't have been better. Again, thank you very much. Everyone in our group said this was a top five trip for sure (and that is saying a lot. We've been fortunate enough to travel to some pretty amazing places). Hi Veronica, it was a great trip. Thanks for all your help. The Eclipse was top notch. No complaints. Probably in a couple of years we will consider doing an Amazon trip. Just a quick note to say thank you for the great organization of our trip to Galapagos. All the arrangements you have made worked out very well and we had a great trip and enjoyed ourselves tremendously. Michael was also a great guide in Quito and he picked the right places to visit. We have no hesitation to recommend you to our friends if they ever plan to travel to Galapagos or to ​ ​ your area of the world in general. We have been back home a week now, and I can't tell you how wonderful our trip was. 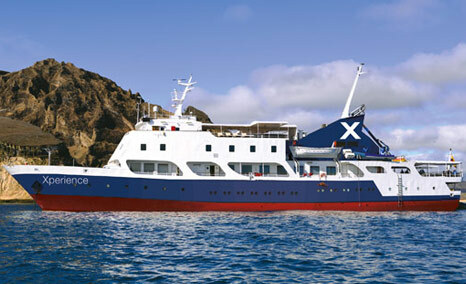 We loved our cruise of the Galapagos, and the Eclipse was excellent and comfortable in every way. Also, Claire got an upgrade in her cabin to a double, No. 3. It was a real treat for her to have a good size cabin and thank you, if you arranged it. The crew was friendly and accommodating, the food creative with local flavors, the shrimp and fish especially, and the naturalist guides were great. It was nice rotating and having different guides. Also, there was a special photographer guide on board, Jonathan Green, who led photo tours, I didn't go on it, though I was tempted, and he gave a talk every night on how to shoot wildlife and scenery. There was so much room on the ship, loved the top deck with lounge chairs and jacuzzi. We snorkeled every day, and saw incredible fish, sea lions, green turtles, etc. It was nonstop adventure, and everyone was enthusiastic and ready for everything. The passengers were very friendly, and quite a few were from England and Canada as well as the U.S. Claire found a lot of people to socialize with and talk about her research in biology, and just friendly conversations, as did Terry and I. The Captain and crew went out of their way to make this a most memorable trip. Every day was unique and we never got tired of viewing the walking among the animals. We also enjoyed Santa Cruz and the Darwin Center, the highlands with the giant tortoises and shopping in the town. The only sad thing is that now our trip is over. It was a trip of a lifetime, and nothing will ever match it. Thanks for all your help, and I will definitely recommend your company and the Eclipse to my friends. And the itinerary that you recommended was excellent. Espanola Island was a highlight and amazing with the cliffs and giant albatross and the boobie nexts. Alyce I am attaching some pictures of us having fun.